When I was a young bride, almost 44 years ago, Jimmy and I went to an older home in Victoria BC Canada on our honeymoon. The home was a large white house. You had to ring the door bell and wait for someone to come and let you in. The stately lady who answered the door was named Mrs Grant. Her father had been a doctor and she had grown up in the house. She guided us through the house and shared so much with the two young Americans. 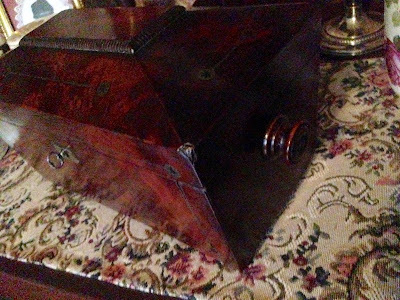 There was one room that had wooden tea caddies on several tables. Oh, they were so beautiful, but way beyond our price range. Yet, it was fun to learn about tea caddies. I have never forgotten that room full of the wooden little boxes that held the precious tea at one time. They all had locks as the tea had to be locked up at one time, due to the cost of tea. 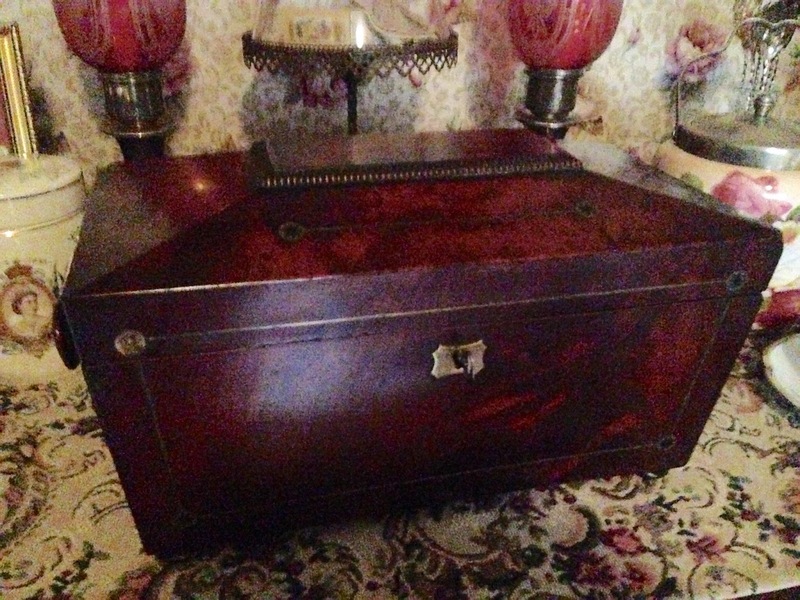 Last weekend, Jimmy won a beautiful tea caddy on bid at an estate sale! It is so pretty and I was just thrilled to finally own one! 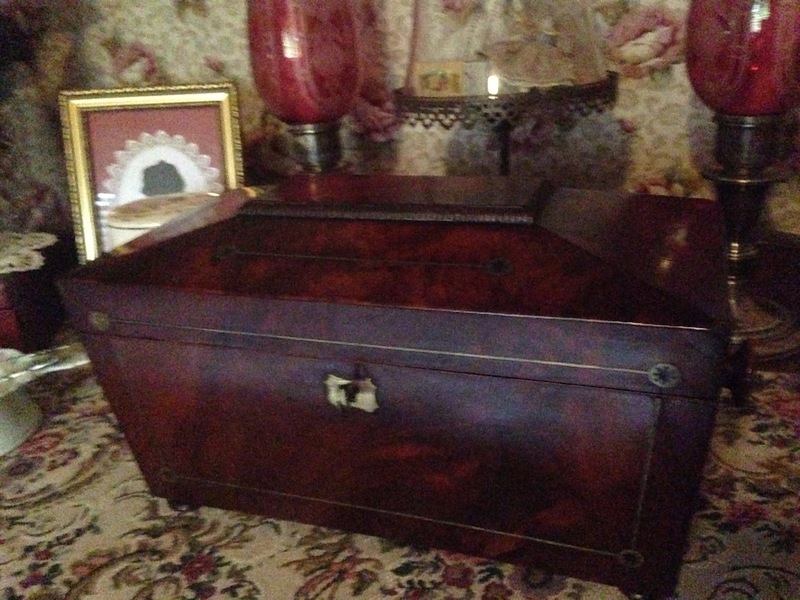 It is made of mahogany and has inlaid brass trim on it. It also has a lock and the key. 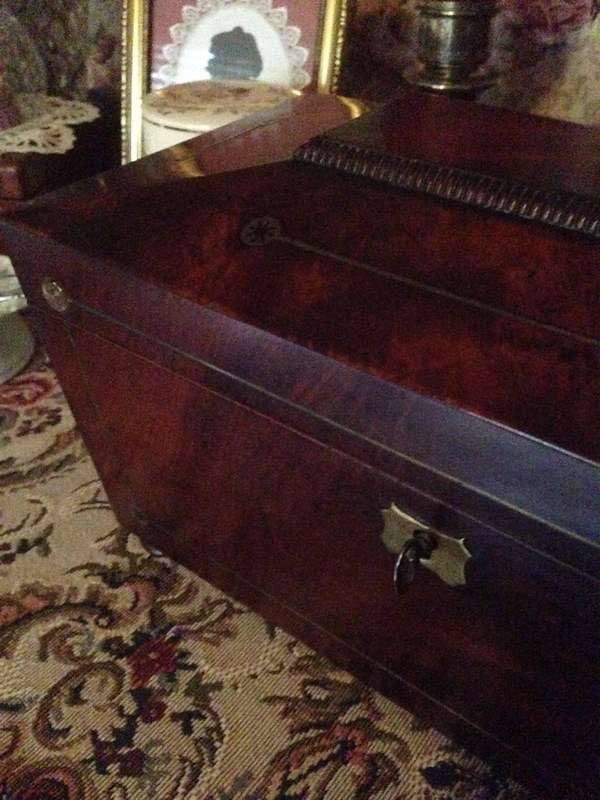 Notice the little knobs on each side. It has the tag inside...the original price tag. It dates to the late 1800's too. It is very nice condition. I do believe that Mrs Grant would have approved of our purchase! I shall treasure it forever. Thanks you sweet Jimmy. Yes, Mrs Grant would have indeed approved of your beautiful tea caddy. It is lovely. Enjoy! Well worth the wait, it is beautiful and something to be treasured.